Recently, I saw a Facebook post of this woman whom I had barely heard of. This post begins with the Wikipedia’s report. The full story is worth the read, especially involving J. Edgar Hoover and his FBI. Quite disturbing and why our history books are so distorted. 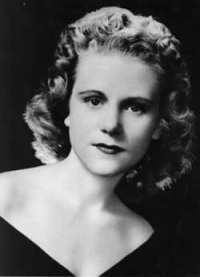 Wikipedia: Viola Fauver Gregg Liuzzo (April 11, 1925 – March 25, 1965) was a Unitarian Universalist civil rights activist from Michigan. In March 1965 Liuzzo, then a housewife and mother of five with a history of local activism, heeded the call of Martin Luther King Jr and traveled from Detroit, Michigan, to Selma, Alabama in the wake of the Bloody Sunday attempt at marching across the Edmund Pettus Bridge. 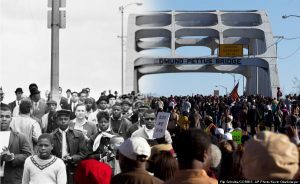 Liuzzo participated in the successful Selma to Montgomery marches and helped with coordination and logistics. Driving back from a trip shuttling fellow activists to the Montgomery airport, she was murdered by members of the Ku Klux Klan. She was 39 years old. One of the four Klansmen in the car from which the shots were fired was Federal Bureau of Investigation (FBI) informant Gary Thomas Rowe. Rowe testified against the shooters and was given witness protection by the FBI. The FBI later leaked what were purported to be salacious details about Liuzzo. The FBI attempted to downplay the situation and discredit Liuzzo by spreading rumors that she was a member of the Communist Party, was a heroin addict, and had abandoned her children to have sexual relationships with African-Americans involved in the Civil Rights Movement. None of these were either proved or substantiated in any way. In honor of Black History Month, Viola’s story is being retold. Her daughter, Sally, responded to the Facebook post a friend had posted and provided much more information about her mother’s legacy. Fearless. And with convictions, she made a difference. A heroine in the truest sense. 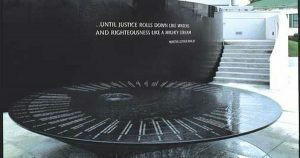 Viola is one of 40 Civil Rights Martyr’s whose name appears on a memorial in Montgomery Alabama. There is a marker at the spot she was killed along highway 80. 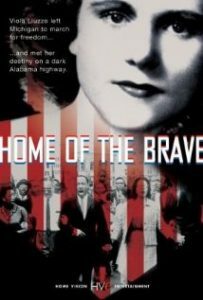 A book was written about her called “Selma to Sorrow, The Life and Death of Viola Luizzo.” And a documentary about her, called “Home of the Brave,” was featured at the 2004 Sundance Film Festival. Liuzzo’s death came at a pivotal moment in the civil rights movement, when President Johnson had been fighting an uphill battle to push the Voting Rights Act through Congress. Her murder is attributed by historians of the era as providing the final piece of leverage that won Johnson approval of the Act in Congress, which forever changed our political landscape. Her death wreaked havoc on her kids, who struggled for years with the brutality of her murder and the years of correcting the wrongs cast upon her by a hostile government. 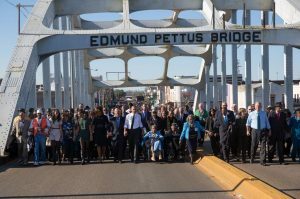 By retracing her mother’s steps on the journey of this documentary, her daughter, Mary, found surprising and profound healing in Selma. 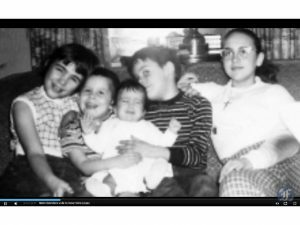 Nearly forty years later, her daughter found some peace. We all know the story of Rosa Parks and her infamous ride on the bus a decade earlier in 1955 and of the other brave souls who “sat at the lunch counter” in silent protest or little six year old Ruby Bridges, being escorted into a segregated white school by 3 Federal Marshalls, both in 1960. Viola’s story is about all of us who watched the injustices and didn’t know what to do. That’s when We started to march along with them. That’s why we march now, in solidarity of the injustices still occurring. No matter from where you come, it’s where you show up that matters! Thank you, Viola, for showing up. Your legacy is right here, for all time.